A helping hand to cross the puddle. Knee high boots that were the envy of all other hikers. A wet log, a tumble, a broken ankle. Injured dog receiving first aid. 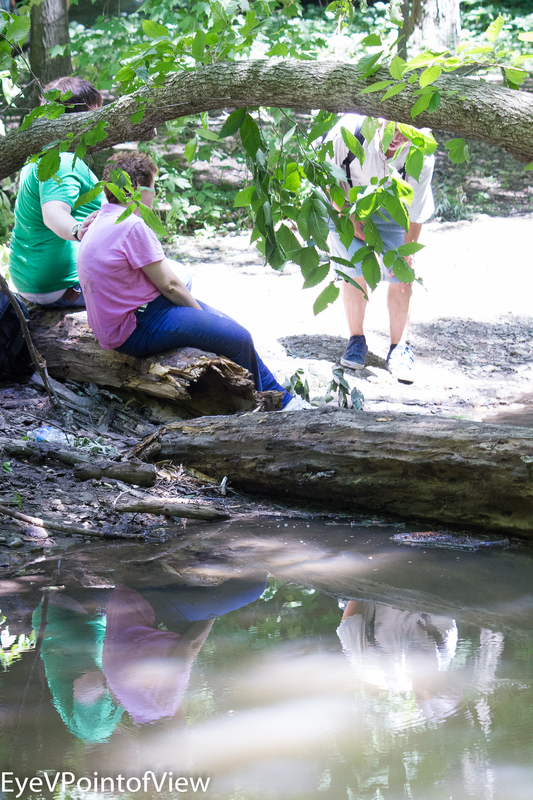 None of these were on my “shot list” at Starved Rock, but they all made for great images. Gentlemen Hike –– Chivalry is not dead, even while hiking. In truth, I suppose it isn’t really just chivalry – helping each other navigate the puddles was a safety issue. We probably all needed walking sticks, of which we only had two to share among the five of us. Boot Envy: Wearing knee high boots on a bright sunny day may not seem like the thing to do – in fact, my friend thought her boots were overkill — but it turns out they were just perfect. 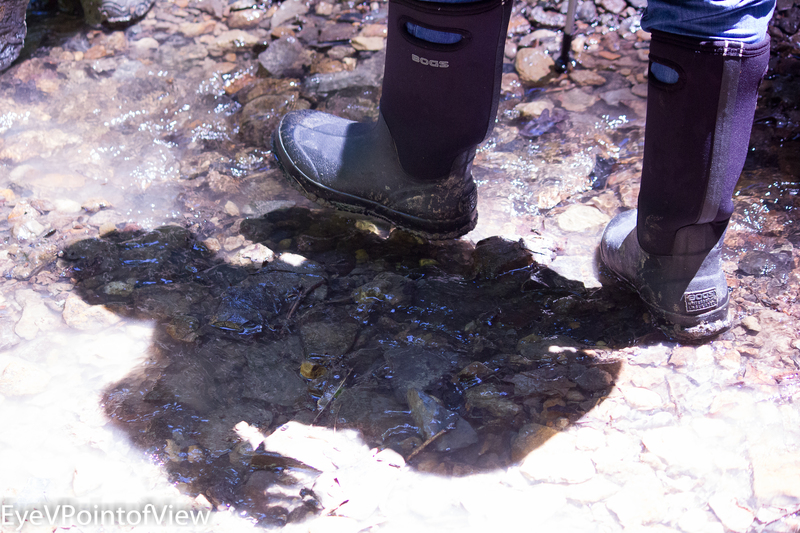 Time and time again, people looked at those boots with envy – wishing they had boots, rather than the athletic shoes most wore (which at this point were quite wet and muddy!). These boots became the “star” of the hike. After The Fall: At one particularly wide and deep puddle, this group went thru the puddle, stepping on the tree. Unhappily, the lady in pink slipped and fell into the water, emerging drenched and injured. While her friends comforted her, I kept moving around, trying to find an interesting but revealing photographic angle (Not to worry, our guide provided some immediate first aid). I ultimately ended up with this shot where you could see their images reflected on the water. Relieving the Pain in the Paw: – Injuries can abound in slippery situations, and man’s best friend may not be immune to getting hurt. 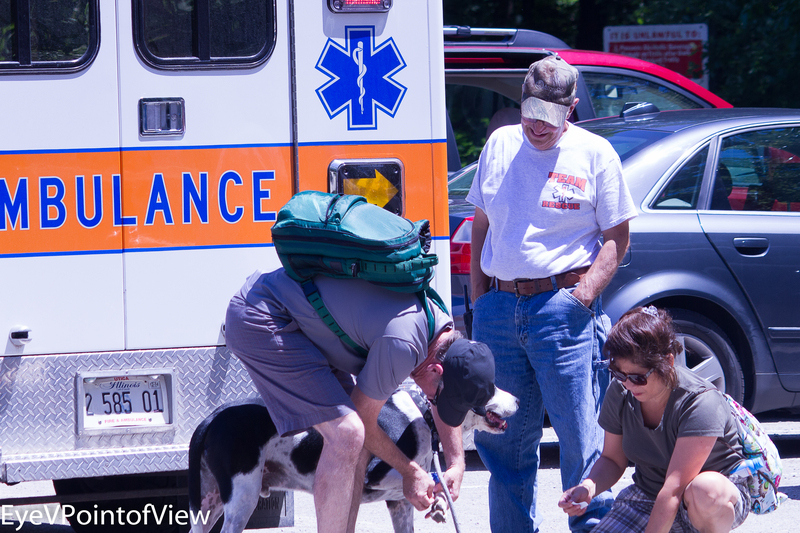 Such was the case with this dog, who is being tended to by its owners while the EMT looks on. 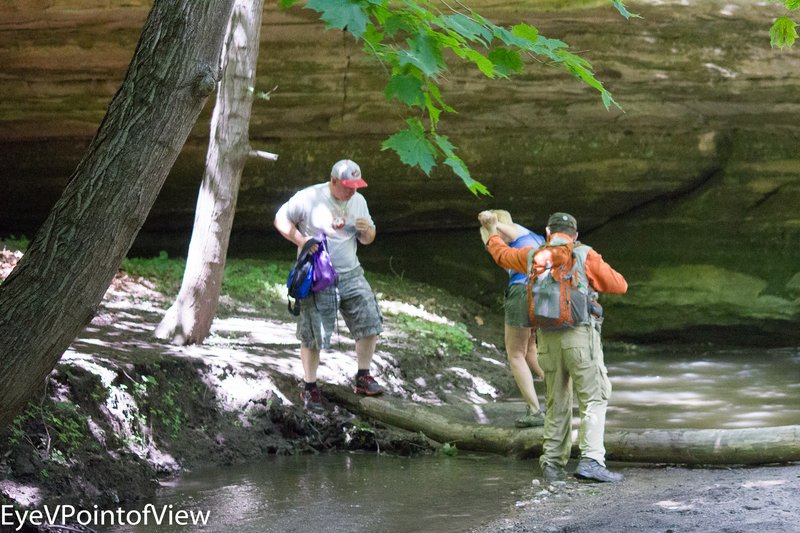 For some of the images that WERE on my “shot list” see my other posts about Starved Rock State Park. I hope you enjoy these totally unexpected 5* selections!